The trapper protects your village with well hidden traps. 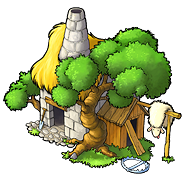 Enemies can be imprisoned and won't be able to harm your village any more. Troops imprisoned in traps eat crop from the village they originally belong to. One trapper can give you a maximum of 400 traps. Troops cannot be freed with a raid. When opposing troops are freed with a successful normal attack, all used traps will be demolished. If the owner of the traps release the captives all of the traps can be repaired for free. If opposing troops get freed by a successful attack, 25% of the trapped troops are lost. If the owner of the captives disbands the troops they will die in the traps and won't return home! Disbanding troops by the troop owner as well as releasing troops by the trapper owner can be done in the rally point. After upgrading one trapper to level 20, additional trappers can be built.